Debra, I wanted to touch base for a couple of reasons. First, thank you for making such an excellent saddle as my Crest Ridge Crusade. I haven't had a chance to call and thank you for your help. My wide backed mutton withered Rocky had such a hard time finding saddles to fit and this one works great. Combine that with his Supra Cinch and he doesn't have any cinching problems at all any more. With other saddles he seemed to be resenting being saddled and cinched and I am sure it was because he was uncomfortable. I just finished a 150 mile horseback wagon train ride from Buffalo SD to Deadwood SD and due to a variety of circumstances ended up riding 5 different horses during the ride as well as 5 different saddles...2 of them custom made saddles. When I sat back into my Crest Ridge on the final day it was like sitting in padded rocking chair. What a relief. 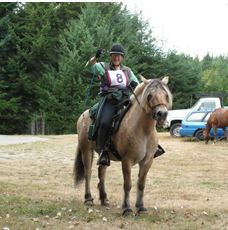 Next year I am riding my own horse the whole way in my Crest Ridge saddle! Thank you again, Debra, for meeting me and my horse Dillon in Mercer, PA on your way home last Monday. When I got home, I took Dillon to my trainer’s arena and got the saddle all set up with the breast collar per your recommendations. Once adjusted properly, the collar definitely made it easier to get the saddle in the right spot, and keep it there. I didn’t get a chance to do anything else with Dillon until Friday, when I took him out for a 2 hour trail ride at a good friend’s property. The last time we were there (mid-September), Dillon was so bad that once I had him loaded back up on the trailer, my friend took me aside and told me that a) she had genuinely feared for my life on the ride, and b) maybe I should consider moving on to a different horse (and she is one to NEVER give up on a horse, EVER). That was when I, still convinced that Dillon’s real issue was saddle fit, went home and ordered my Crest Ridge Sinclair saddle. So, this was Dillon’s chance for redemption. With his new saddle properly fitted and rigged for his conformational “features”, we went out for nearly two hours over very challenging terrain, and Dillon’s performance just blew everyone away! He was simply AWESOME. After almost two years of frustration, hard work, research, and faith, I finally have the horse I thought I’d bought, and I love him! THANK YOU SO MUCH. Here Is Champ in his custom made Crest Ridge saddle and breast collar and saddle pad. It fits him wonderful and he has been riding great now. No refusing to go forward and so on. No more saddle slipping and sliding either. It is a very comfy saddle for me also. 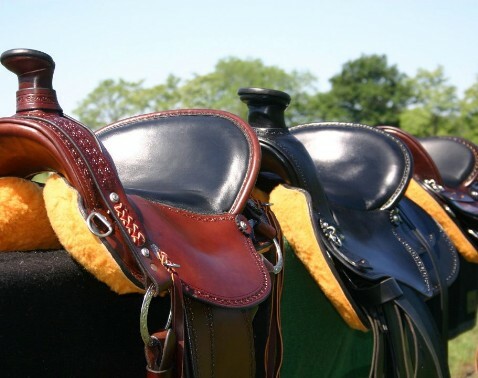 It is such a pretty trail saddle and I get a lot of compliments on it. His Crest Ridge headstall and braided reins are also wonderful. Champ and I Love everything. I highly recommend you to everyone. Thanks Again! Just had to send you an email, about how awesome the Crusade combined with the wool felt pad from Crest Ridge is on a Short backed, roached backed and a rather round sort of belly (even when he is fit) Standardbred. You forget at times, the freedom the horse gives you when you ride. You know those day's, where you could ride all day? Sunday was like that, and the fact that Coppy was moving beautifully under the saddle, and Cantering along and reaching forward into the canter. Which he won't do with an Australian Stock Saddle (Australian Made) or the Wintec Range of Saddles (ie. 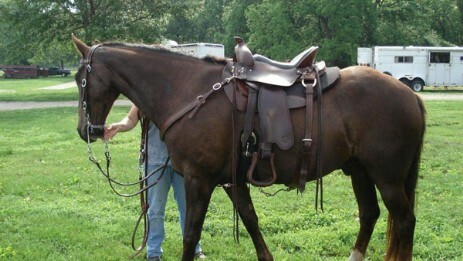 Isabell & Stock Saddle). Basically he was having a ball, going from a trot into a canter, and then picking up speed in the canter, and when I asked him to whoa up, there was no need to use the reins, and even better, he went back into a trot, where as generally with the other saddles, he would go back into a pace. Plus I feel so super balanced in this saddle, and ride along on a loose rein, as even if he did shy, I can feel my weight evenly distributed on my seat bones, and down to the balls of my feet. Just wanted to share with you the positive riding experience I have had in the Crusade, and how as a rider you truly appreciate such a great saddle. Have a truly awesome week-end.